Ultra-thin LED strips can be mounted virtually anywhere with minimal space required. Each light strip is 10" long, flexible to mount around corners, and 100% waterproof for years of worry free use. 2 & 4 light kits are designed be used on most vehicles. Plasmaglow Thunder Grille Light Kit are available in 9 unique colors to fit your style and personality. Plasmaglow offers the LED grille light kit in two sizes to fit any size grille on your car or truck. The LED light kit offers easy installation with a simple 2 wire hookup. It also includes mounting hardware and a toggle switch. 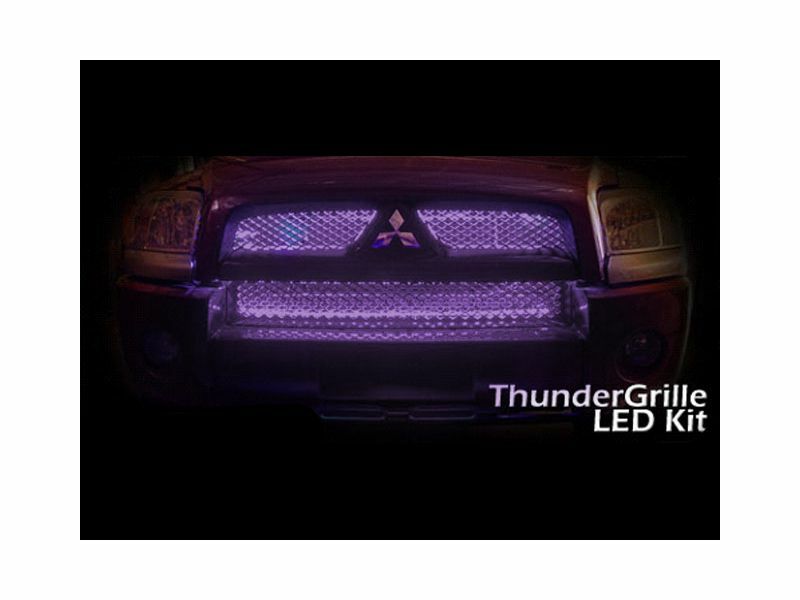 Plasmaglow ThunderGrille LED light kit is the wildest way to dress up your car, truck, or SUV. Aftermarket LED lights for your grille will get all eyes on you and your ride! These custom LED grill lights mount behind your vehicle's grille to illuminate the entire grille area of your vehicle. Plasmaglow LED lights for your factory or billet grill insert are offered in 2 sizes so they will perfectly fit vehicles with small or large grilles. You can also match the LED lights to your personal style with the 9 different color options Plasmaglow offers! Each ThunderGrille LED light kits will include a flexible 10" long led light strips that can be mounted on flat or contoured surfaces. It also includes mounting hardware, an on/off switch, and detailed instructions. It offers an easy two wire hookup that allows you to wire the lights into their existing running lights or the included switch. Plasmaglow ThunderGrille light kit is backed by their amazing limited lifetime warranty. The Plasmaglow ThunderGrille Light Kit is backed by a limited lifetime warranty. The Plasmaglow ThunderGrille LED lights offer an easy at home installation. Mounting hardware is included for a variety of installation scenarios. Users can use the included mounting clips and/or screws that will require drilling. For additional information please call us at 877-216-5446.